By looking at the past, scientists can sometimes estimate the future. Using current rates of rise in sea level and coastal erosion, it is possible to project the future shoreline around the Delaware Bay. The animated map to the left shows a comparison of the Delaware and Chesapeake Bay coastlines of the past and present, and projects their outlines into the future. The most important question to ask is "Is there enough ice in the world's ice caps to raise the sea levels to the heights indicated?" If there is enough ice, and if the current rates of erosion and sea level rise continue, this could be a probable future geography. Of course, it is also possible that a glacial advance could begin once again, as it has so many times in our planet's long past. Then, the shape of our current world might look more as it did 7,000 years ago. Photo reconstructed from the University of Delaware's Spatial Analysis Lab. To view full size, click here. In looking at our past, we know that many species that once thrived (sometimes for millions of years) are now extinct. In our planet's history, this has been caused most often by large climate and geological shifts, sometimes created by meteor impacts. In our more recent past, it is human expansion that has placed the largest stresses on plant and animal populations. Sometimes, this has been caused by our use of animals for food, fur or farming (i.e., the use of horseshoe crab for fertilizer in the 1900s) or by our harvesting of native flora (see the depletion of white oak forests in the 1700s). Today, one of the largest impacts on native wildlife populations comes from the expansion of housing and development, which erodes wildlife habitat. 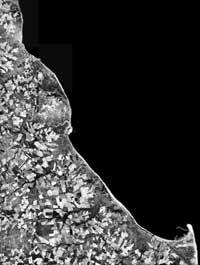 The aerial photography map to the left, taken in 1992, illustrates the expansion of human development in one section of the Delaware peninsula.